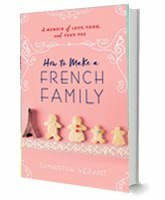 Samantha Verant: Pre-order How to Make a French Family...and You'll Have the Chance to Win a Grand Prize!!! 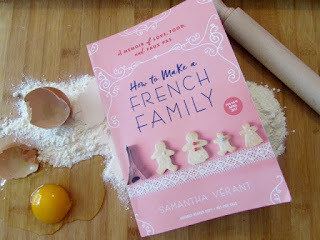 Pre-order How to Make a French Family...and You'll Have the Chance to Win a Grand Prize!!! Pre-order How to Make a French Family, due out on April 4th, and you'll receive a special recipe card not included in the book PLUS you'll be entered to win a grand prize of French inspired baking tools! Deadline for entries is March 31st! The book can be pre-ordered at Amazon, B&N, Chapters/Indigo, etc. Take one French widower, his two young kids, and drop a former city girl from Chicago into a small town in southwestern France. Shake vigorously...and voilà: a blended Franco-American family whose lives will all drastically change. Floating on a cloud of newlywed bliss, Samantha couldn’t wait to move to France to begin her life with her new husband, Jean-Luc, and his two kids. But almost from the moment the plane touches down, Samantha realizes that there are a lot of things about her new home—including flea-bitten cats, grumpy teenagers, and language barriers—that she hadn’t counted on. 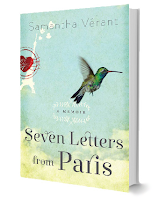 Struggling to feel at home in her new home and wondering when exactly her French fairy tale is going to start, Samantha starts to wonder if she really has what it takes to make it in la belle France. But when a second chance at love and life is on the line, giving up isn’t an option. How to Make a French Family is the heartwarming, sometimes hilarious story of the culture clashes and faux pas that, in the end, add up to one happy family. And here's the latest glowing review from Booklist! Please DO share this post!!!!! Many Bisous!!! !